Dirty Dancin' ;) - You don't know me. And LOL. This kid gives the best dirty look. I giggled lots. ETA.. Apparently Heath Ledger has been found dead. Right after Brad Renfro last week. :( This is so sad. "So, that is what Mom and Dad do in their alone time. Now, I understand dancing under the sheets!" LOL, nice. ;) Just so long as he doesn't walk in to Mommy's Arabesque. "alrighty time to sneak away and watch some por....aw man! Vincent's father sat resignedly watching his son, who also spoke with a lisp and liked needlepoint, enjoy the ballet on TV never realizing that the boy would grow up to be a professional Football player, NASCAR driver and the world's most notorious polygamist. I LOVE YOUR ICON. Oh my god i love that sketch, when he loses it.... there is nothing greater than Stephen Colbert and Jon Stewart totally losing their sh!t. When that happens, an angel gets its wings. i dont have a caption for you because i can't think of anything funny. its a sad picture to me. Why is it sad for you? Your icon makes me giggle... but it also makes me nervous. 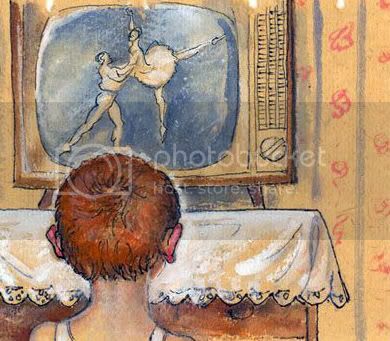 Little Billy was so mesmerised by the television that he didn't realize he was in a postmodern victorian postcard. "And coming up, our top story, Ballerina skewered on partners right arm. Film at Eleven." LOL. Dont' they always get banged by the cute figure skaters? See Mary, I told you we shouldn't let Tony watch Arthur! Damb Binky! Educational my foot. The kids watching wrestling from now on! What do you mean its watching men in spandex shorts rolling around fighting over a belt isn't more manly?